Welcome to our lake home! 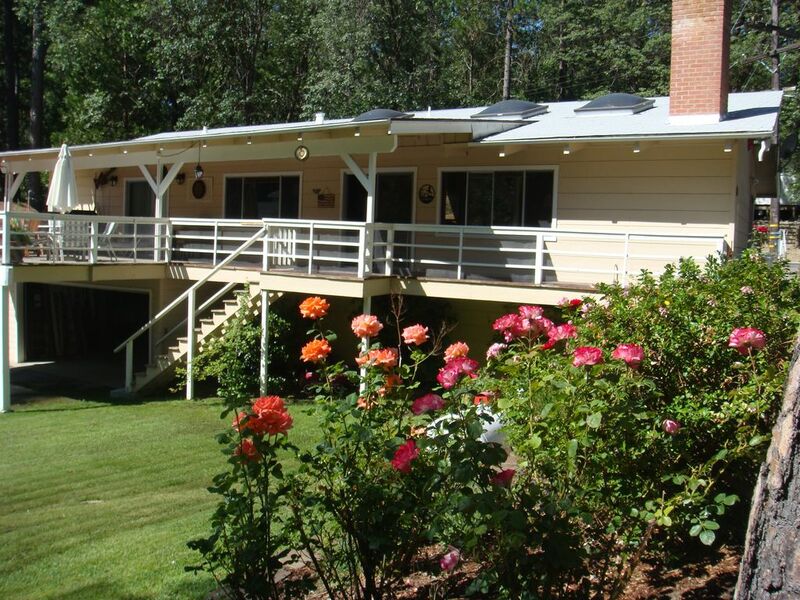 This has been our year-round retreat getaway for nearly 30 years. Legend has it that when our dad walked by and saw the lake view from this home, he offered cash on the spot. The rest is history. Our home is located in the coveted Willow Cove area and is walking distance to the Pines Village where you will find three restaurants, a full service grocery, deli, bakery/pizza, a souvenir shop and a surf shop. Our lovely home has 3 bedrooms, 2 full bathrooms, kitchen and a Great Room on one level, and an 'in-law' type bedroom downstairs with a separate entrance and full bathroom. The interior of our home is adorned with notty pine and is decorated very homey with touches of family and Bass Lake history. Our front yard boasts one of the only grass lawns in the area and is great for children and outdoor games. Saving the best for last, we have a large deck that features breathtaking year round view of the lake for BBQing and outdoor dining. ****All bedrooms are supplied with comforters, blankets and pillows. Guests are required to bring linens. There is not a boat slip or access to a pier for the rental, however you can easily rent one through the Pines Marina for an additional cost. The Pines Marina is a short walk from our home (less than 1/4 mile). We can supply you with their number if you are interested. On the lake itself there are three marinas open in the summer, The Pines, Miller's Landing and The Forks. Each have gasoline, dining outlets, boat rentals (fishing, ski & patio) & jet skis for rent. You can also plan a day trip to Yosemite Valley (1 hour drive) to see the famed granite walls of El Capitan and Half Dome, along with the breathtaking waterfalls, Yosemite, Bridalveil, Vernal and Nevada (spring & summer months are best for water flow). If you get an early start you can trek Half Dome for an experience and view of a lifetime. It is a tough hike at 16 miles round trip and 5,000 foot elevation gain, but worth every potential blister. Whether you are planning for a quiet Winter get-away, or an active Summer vacation, Bass Lake will not disappoint. Bring your family, friends, and neighbors. Build memories that will last a lifetime and start a new tradition....vacations at Bass Lake. For additional information on local attractions please visit the Bass Lake Chamber of Commerce website. Ask any home owner in the area and they are most likely familiar with our dad, Jim Ackroyd. Our dad served as the Administrator to the Homeowner's Association during the time when homeowners came together and purchased the leased land from PG&E. No small feat and our dad played an integral role in the process. We are very proud. Our dad passed away September 2004 from cancer. We are telling you this not to make you sad but to invite you to truly enjoy what this lake and home have to offer. Our father lived life to the fullest and this home was a conduit to his favorite activities - BBQ's, boating and reading the paper on the deck. While staying at our home you'll enjoy the warmth and comfort of a family home. Many rentals are sterile, loosely stocked with items and give no sense of who owns it. Our home is the opposite, it's fully stocked for entertaining (food gatherings are our favorite), well maintained and emulates a warm family experience. You are invited to enjoy it to the fullest. Forced Air in 3 of the 4 Bedrooms. The 4th Bedroom has a Ceiling Fan. Swamp Cooler in Great Room. 2 car garage. Great for motorcycles, bicycles, kayaks etc. Inside dining for 8 at one table and 4 at another. Outside dining for 12. Flat screen TV in the Living Room and the Master Bedroom. Thank you Niketa and thank you for your suggestions for our home. We look forward to welcoming you back. Fabulous View from the deck! This was our first visit to Bass Lake! The house was perfect for our short stay. Very much a family home! Well stocked for cooking at home. Loved the community feeling in Willow Cove. Easy walk to the market and boat launch! Thoroughly enjoyed the Mexican Restaurant Casa Velasco we walked back to the house and watched a stunning sunset! Heather Ackroyd was easily available for questions during our stay. We will definitely be back! Great house for families with children! Thank you Terry. We look forward to welcoming you back. Great views of the lake. Nice large front deck with ample seating. We had a fantastic time celebrating my friends birthday. The house was terrific! We went with two other families, 5 adults and 6 kids total. There was plenty of room for everyone. The house is nice and clean and the kitchen is fully stocked which was a pleasant surprise. The back deck (with a view of the lake) was our favorite place, it is huge and the giant table fit everyone and thus made it a great place to have breakfast and dinner. The only thing is that the BBQ could use a little TLC as it must be lit with a butane lighter which is a bit of nusiance. The AC and swamp cooler did a great job keeping the house comfortable during the 90 degree days. The only room that struggled with the temp was the in-law suite downstairs as it still was a bit warm overnight. There is a fan in the room so the helped keep it comfortable. In terms of location, it is hard to beat for the price. Easy walking distance to town, about 10 minutes, which made picking up groceries at the market very convenient. We preferred walking to dinner rather than having to take multiple cars. All in all I would recommend this property and will likely us it again in the future. This house had everything we needed! I loved the location in Willow Cove as it is close to the Pines. I just wish it had a boat dock, but other relatives in the area had a dock close by that we were able to use. I would totally rent this house again! Thank you. We look forward to welcoming you back! Our favorite house on Bass Lake! My family has been coming here for over 30 years and each time it is a new experience. Great times hiking at The Falls and Devils Slide. Take plenty of water on this hike. Good times on the lake as usual. Willowcove was a little quiet this 4th. Love Bass Lake! Remaining security deposit is returned to you 14 days after your departure, provided the home and grounds are left in good order.